Imagine trying to navigate a maze, wandering through unfamiliar passageways and making turns with little certainty you’re headed in the right direction. After roaming around for a while, things begin to feel familiar. A sense of “I just walked through here” begins to creep in. You come to a fork in the road and realize the one thing you didn’t want to happen, happened. You got yourself lost. For some Sailors who recently arrived aboard the aircraft carrier USS Nimitz (CVN 68) this was a reality all too familiar. A few weeks ago they were flown aboard the deployed Nimitz by a C-2 Greyhound, from the “Providers” of Fleet Logistics Support Squadron (VRC) 30. Lucky for them they wouldn’t be lost for long, as they would be going through School of the Ship (SOTS), otherwise known as indoctrination, in their first days aboard the ship. ­­­­Seaman Apprentice Daniel A. Colon, from Houston, was one of those Sailors flown aboard Nimitz and he recalls being in complete awe when coming aboard his first U.S. Navy vessel. Colon quickly learned that he wasn’t the only who was lost on the ship, as he would join new Nimitz Sailors in SOTS. 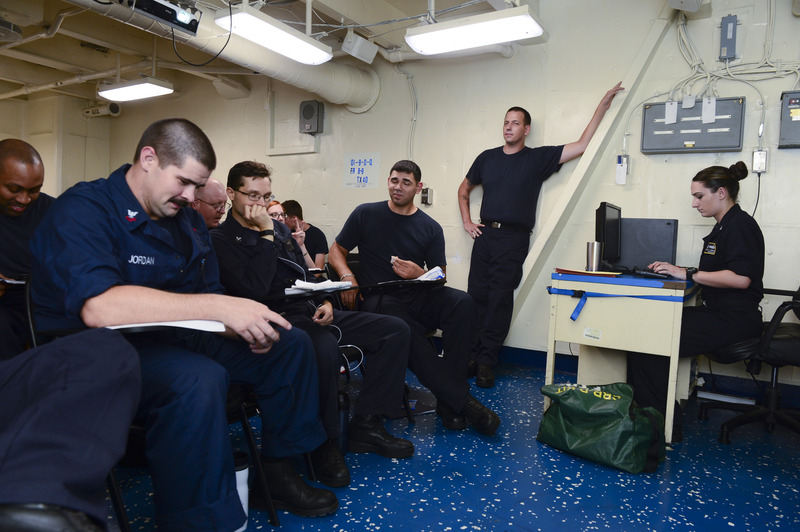 During the seven-day process, these new Nimitz Sailors had the opportunity to learn about the ship together. They learn from experienced Sailors who come in and speak about the departments and organizations that they belong to on the ship. Topics ranging from damage control to safety to fitness and even the religious services available are discussed. Many of the instructors give locations to their shops, which help the new Sailors get familiar with the ship. Senior leadership aboard Nimitz such as the commanding officer, executive officer and command master chief introduce themselves and discuss the ships schedules, activities and port calls. Completing SOTS with Sailors going through similar situations allows for an easier transition for the new Nimitz Sailors. “It helps to know that there are people aboard going through the same experience as you,” said Hull Maintenance Technician Fireman Emily Marko, from Lebanon, Pa. In addition to being able to share mutual experiences, they have the opportunity to associate with Sailors from different departments on the ship. Sailors in SOTS share advice and tips they learned from their short time aboard. This is also where they begin to form new friendships and networking skills that will come in handy in the future when they begin their jobs and start getting their qualifications, a process that begins after the completion of SOTS. But waiting to complete SOTS, has some of the more eager Sailors a bit restless. Current training team member Aviation Boatswain’s Mate (Handling) 2nd Class Andrew Valencia has noticed that a lot of the Sailors that come to SOTS, want to learn the basic ship information provided in SOTS as quickly as possible in order to start doing their jobs. Even though SOTS may take longer than some Sailors would like, it’s a necessary tool to help Sailors navigate the maze that is USS Nimitz. Learning the ship and its day-to-day operations can be tough, but doing so helps Sailors better understand Nimitz’ mission and their jobs. “We all came here together, we’re all here learning together, so we’re going to get out of this together,” said Colon.